A man driving a stolen vehicle twice rammed a Santa Maria police car, then led officers on a chase prior to being arrested in a residential area. Around 11:56 a.m. on Sunday, an officer stopped a vehicle he had spotted speeding near the intersection of Benwiley Avenue and Fesler Street. When the officer got out to speak with the suspect, the driver reversed and backed into the patrol car, according to the Santa Maria Police Department. 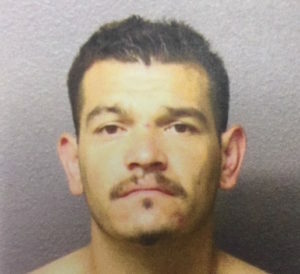 The driver, Antonio Sanchez, 32, of Santa Maria, then reversed into the patrol car a second time and fled the area. Sanchez led police on a short car chase before pulling into an apartment complex parking lot and fleeing by foot. Officers established a perimeter, searched the area, found Sanchez and took him into custody without incident. Police booked Sanchez into the Santa Barbara County Jail on charges of assault with a deadly weapon, felony evading, possession of a stolen vehicle and having an outstanding felony no bail warrant.